Michigan attorneys, MAP participates in the Access to Justice (ATJ) Campaign, a collaborative centralized campaign, administered by the Michigan State Bar Foundation in partnership with the State Bar of Michigan. To make a charitable contribution, please donate online at this link. 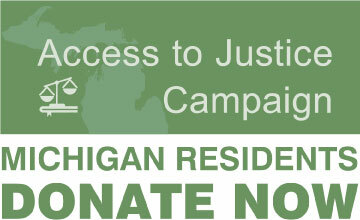 100% of your donation will be distributed to support civil legal aid to the poor throughout Michigan. Donate online here to make a non-attorney donation (including recurring donations!) to MAP or any of our programs including Legal Services of South Central Michigan, Farmworker Legal Services, Michigan Immigrant Rights Center, Welcoming Michigan, Michigan Legal Help, Michigan Elder Justice Initiative, and Michigan Poverty Law Program. To request additional information about donating to MAP, please contact Alyson Robbins, Manager of Outreach & Development, at arobbins@lsscm.org or (734) 665-6181. MAP is funded in part by the Legal Services Corporation. Please be advised that your contribution to MAP, Legal Services of South Central Michigan, or Farmworker Legal Services may not be used in any manner inconsistent with the Legal Services Act and Regulations.